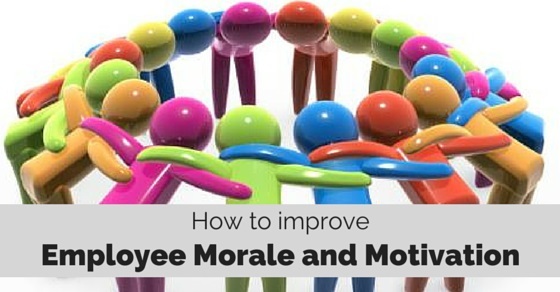 How to Improve Employee Morale and Motivation? You would have observed in some firms where there are gatherings arranged for only employees and sometimes with their families. Sometimes, a birthday party is being organized by the executive secretary for the employee at a small restaurant. It’s a nice way for organizations to show that they care about the employee. These are small boosters to the morale of the employees. Companies are looking out for alternative or creative way to encourage their employees, as these are ways to keep them motivated. Look into the way the employees start their day at office time. Do they have dull gloomy look in their eyes? Was there a laughter missing in the arena? Then it needs to be changed for the betterment or improvement in the morale to get better productivity. Leaders! Keep a watch on the mood of the general employee environment as the mood can impact on the productivity. If you want to make your work place lively, then have a glimpse into some of the tips that can be adopted for making a change in the moods. All employees desire to be rewarded for their extra effort or doing a work out of the ‘norm’. A reward system should be able to differentiate between performance based and behaviour based. Performance based rewards are directly linked with the goals of the company. For instance you could provide incentive plan for periodic achievements in case of sales targets. Behaviour based rewards cannot be easily implemented. It has to be based on specific behaviours that you as leader are looking out for, that will help in the improvement of the business. Normally rewards are associated with proper benefits. If the benefits have much more weightage than your competitor then you are likely to have retention rate! So take due care to address the proper benefits after thoroughly reviewing the benefit scheme in the market. What do you mean by ‘Recognition’? It is just to acknowledge an employee in front of their peers for their accomplishment. Every employees is eager to know if their performance is good or bad. By having appropriate recognition plans, it’s sure to make a lot of change in the execution of work. It could be financial or non-financial. For example, you could organize a lunch gathering, small award events or occasions, display on the notice boards or in house newsletters. Have you as a leader appreciated your peers for their exemplary works? It is noted that small appreciations makes a whole lot of difference in the way the assignments are completed. Appreciation can be in the form of statements or expressions like an email to all the team members appreciating their work, a message on the notice board or in form of a statement during the monthly meetings in front of employee’s team citing with examples about their accomplishments. Are you always the sole decision maker for an activity where the team is involved? You can see that you might not get 100% co-operation to the activity to be done. Just say that you allow the team members to be involved in the decision making and you would see the difference it makes for the activity to get it done. Do you delegate some of your functions? Then surely you are allowing your team to carry out their work with responsibility and care utilizing their skills. You as a leader would have noticed that each team member have different talents. Some excel while some drag behind. Initiate a training program for the ones dragging behind to help them grow within. By helping them to grow in their career, you are actually motivating them. For the others allow training programs that will help for future assignments so that they are in track with the mission of the organization. How would it be if you wish a 50 year old team member on their birthday with surprise cake? Even getting involved in wedding anniversary or new born events of life of an employee shows that you care and value them as human beings. Try to adapt this in your place if you haven’t organize. Consider your employees as the life blood of your company with highest priority and make them happy. Is there a birthday round the corner, get a card and make everyone to sign on it and show your love for them as family members. Its sure to make a huge impact. A smile to your colleague everyday keeps the negativity away. It is said that smiling is more stimulating than ‘xxxx’ amount of money in cash. Smiling has a powerful feedback on our emotions and thereby mood of the work area as well. You could also be considered as a person who is comfortable and could be approached. This is one of the factors to boost the morale of the workplace. Encouraging idea sharing helps in sharing of thoughts and knowledge that makes a strong team. Sharing is one way for the people in your team to know more about the business and help to create innovations. Open book strategies are found to foster a stronger relationship within the team. Informing co-workers about critical and financial data and explaining to them about the information will help to influence the success of the company. Having transparency in your dealings with your co-workers is very important to maintain trust within the members. Whether providing feedback on their performance, sharing information or taking decision, it’s important to maintain transparency. For maintaining transparency, communicating effectively with appropriate words is the key. Breaks are always necessary for refreshing ones moods. A cup of coffee at the pantry room, smokers going out for smoke, a small walk down the stairs and back to their seats will help employees to refresh themselves and be ready to carry forward their assignments. Hence, make “breaks” as mandatory for your work place. Everyone would like to grab a cup of coffee or light snack during breaks. Even providing free morning coffee is not a bad idea! Even in budget cuts, it’s better for companies to provide morning coffee and evening tea with small budget snacks. The productivity increases and even if they have to stay late they are sure to grab a snack and complete the work for the day. Has your key team mate been working out extra hours every day to complete the assignment that is due to be done? Then it’s time to review the tasks given or assigned and find out ways to ease or relieve the stress off him/her. The ease can be in the form of a new recruit or delegating to other team members. Overworking will definitely demotivate and ultimately morale. Have your ever been able to attend your child’s school annual day programme? Then you are in good hands at your office. The management is allowing you to take part with your family needs as well as your work. In such cases, you would feel that you are obliged and do take extra step to execute and complete your work on time. The morale is better among the employees where the company understands the work-life balance. Have you seen a small box labelled as “Suggestion box” at the entrance to the main office? Some offices provide this box so that employees are allowed to drop in their suggestions for improvement of the company. The HR needs to be in charge with the management’s approval to maintain confidentiality. If suggestions are rewarded then you are sure to receive more suggestions every day!! It motivates the employees and make them feel that they are also part of the company’s business. Companies sometimes organises excursions to exotic place or resort for their employees and their families. Sometimes the gatherings are organised with dinners and fun filled with games for the elders and children. Companies find this a chance for its employees to gather outside the office environment to get chance to meet cordially and bring the team closer. Once the team gets closer their misunderstandings vanish and all work towards one goal. Now that you had a review of the facts that could improve the morale and motivation of the employees, make a comparison on the strategies that are within your organization. Look out to see if the strategies align with the benefits, compensation, recognition and appreciation of the employees. Also review if the benefits are driver for the performance goals and right behaviors. By adapting some into your organization you are sure to reap the benefits of success in course of time. Next articleTop 13 Signs of a Toxic Workplace: How to Survive In It?